Couture Drama: Yves Saint Laurent, Fall/Winter 1979-80. 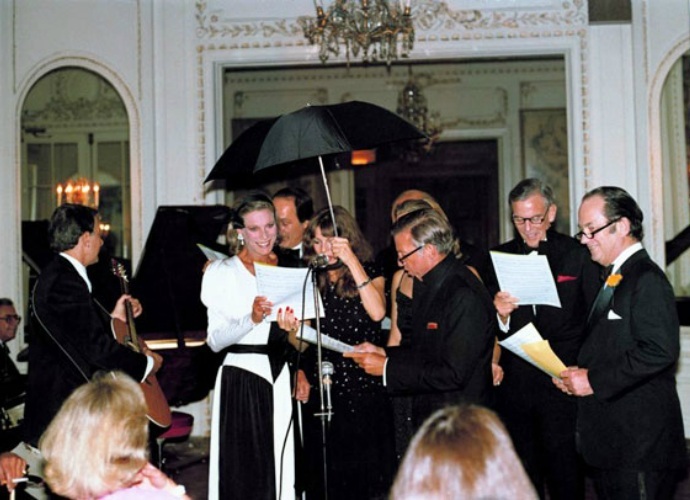 On July 25th, 1979, Yves Saint Laurent presented his Haute Couture collection for Fall/Winter 1979-80 at the Ritz hotel in Paris, culminating in a standing ovation from the audience. He offered the collection as “an homage to Serge Diaghilev and to his collaboration with Picasso”. 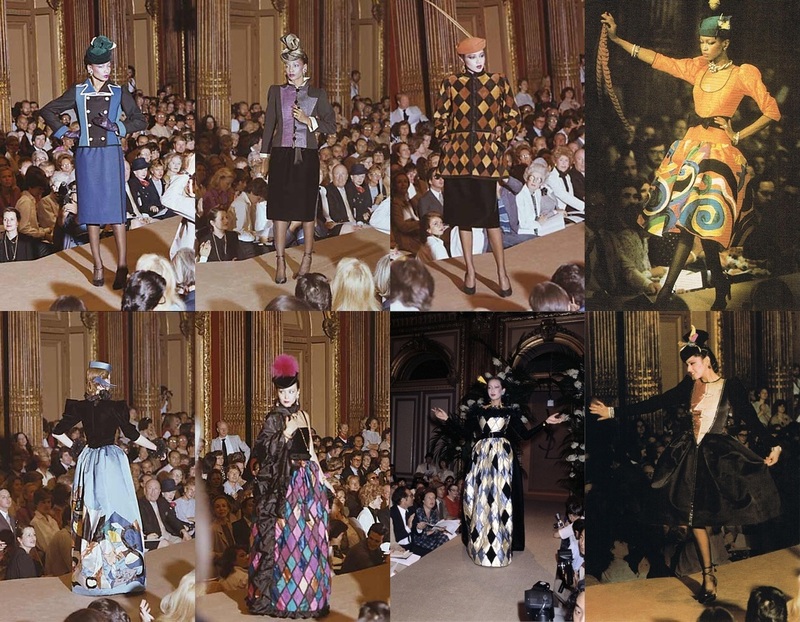 Later that same year, Vogue Patterns had drawn three looks from Saint Laurent’s Diaghilev/Picasso collection and delivered them in the form of three patterns: 2406, 2407 and 2408. These patterns were first introduced to North American customers in the January 1980 counter catalog, just in time for the Fall/Winter 1979-80 Holiday season (which I believe would have actually been available in-store for December 1979, however England, and possibly other countries, had to wait one more month for the February 1980 catalog to reach stores). 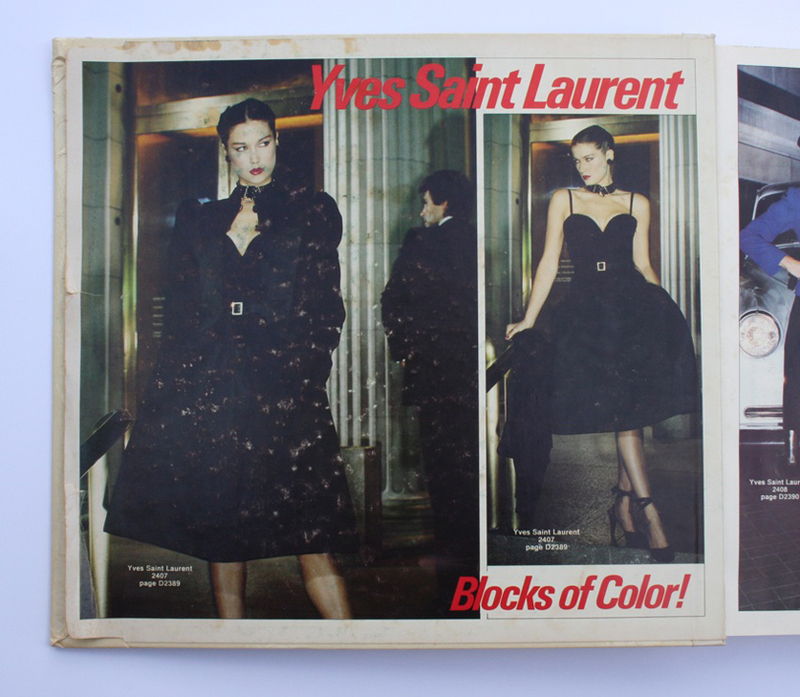 The catalog offered ‘Blocks of Color!’ and ‘Couture Drama’ by way of Yves Saint Laurent. 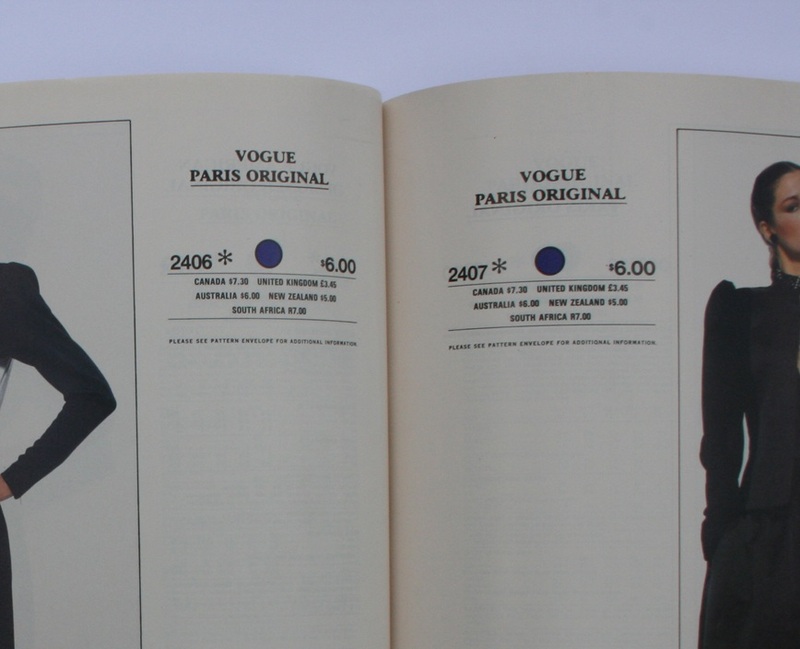 Just inside the front cover of the catalog, the Yves Saint Laurent originals are shown photographed on models Clotilde and Eva Voorhees, two top models of the period (Clotilde can also be seen on the pattern envelopes for 2407 & 2408. She was a Saint Laurent favorite for the runway and she even appeared in a television advertisement for the perfume ‘Rive Gauche’ in 1980). 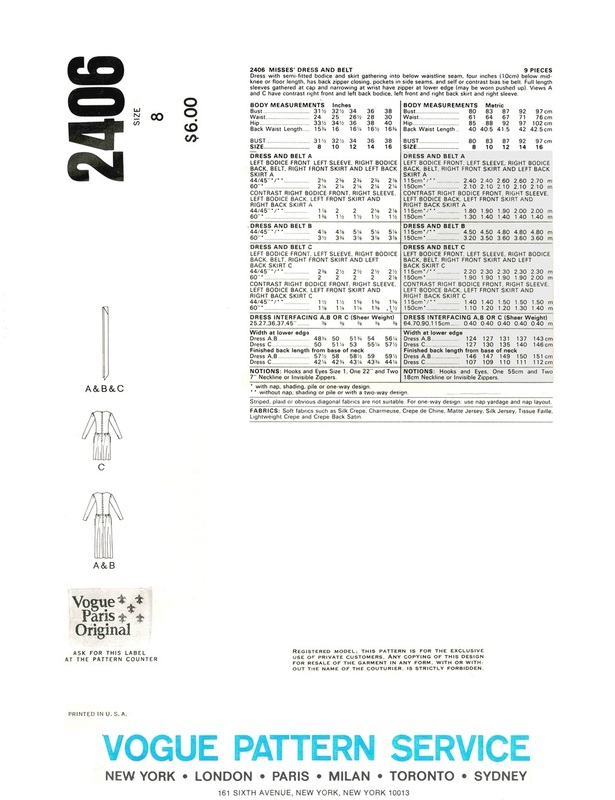 According to the ‘Guide for Fabrics and Accessories’ toward the end of the catalog, 2407 is shown with Yves Saint Laurent shoes, and 2406 with Yves Saint Laurent shoes and handbag. The photographs evoke the excitement of heading out for a night in style to dinner, a fabulous party, or formal occasion. As long as you were quick getting the pattern and then even quicker at sewing, or getting someone else to make up your pattern, you could have been seen wearing the same style in the same season as one of Saint Laurent’s Haute Couture customers! Best-dressed American Nan Kempner wearing a Saint Laurent original. Nan Kempner, a woman considered to be one of the best-dressed American women of her time, wore the design that Vogue 2406 was based on. 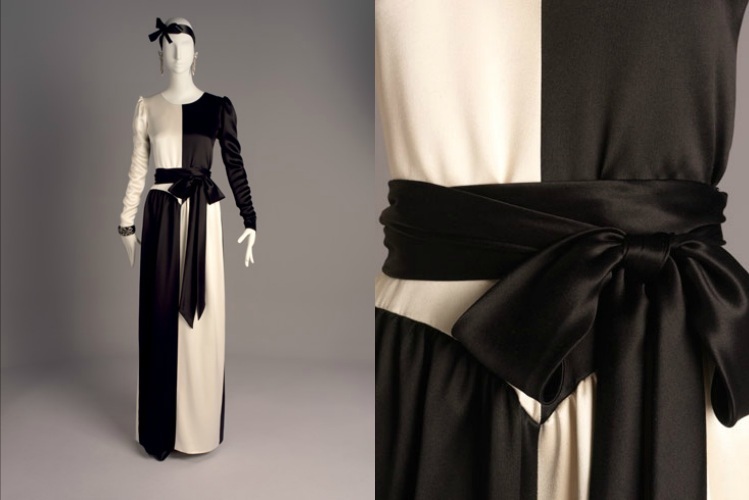 This gown was made from contrasting blocks of black and white silk satin-crepe. This is a strikingly graphic design that seems to evoke the bold cubist elements of Picasso’s designs for the characters of the French Manager and the American Manager in the 1917 Ballet Russes production of ‘Parade’. 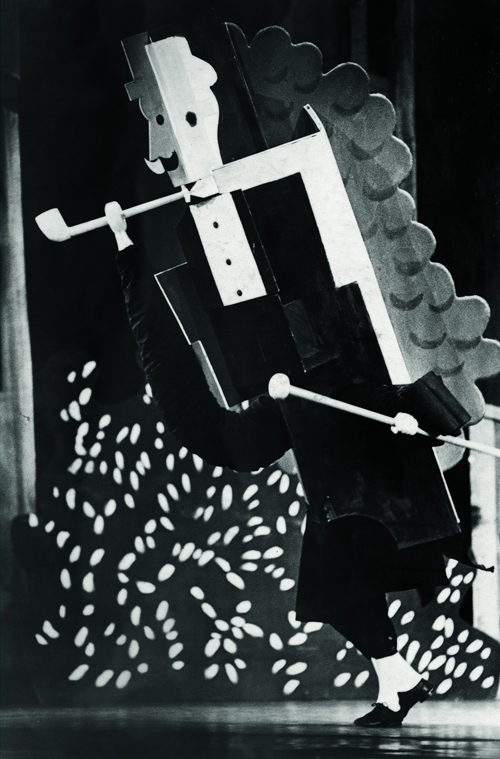 Photograph of the ‘Manager français’ character from the original 1917 Ballet Russes production of ‘Parade’, with costumes and sets designed by Pablo Picasso. Also, in one of Picasso’s sketchbooks from around 1916, as published in the book ‘Je Suis Cahier: The Sketchbooks of Picasso’ (edited by Arnold & Marc Glimcher), there are drawings of Harlequins and, although there was no Harlequin character in ‘Parade’, it is believed that these drawings reflect some of Picasso’s first ideas for the production of ‘Parade’. 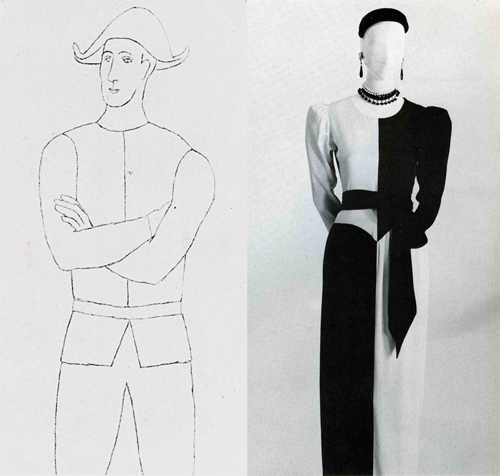 There can be seen a close resemblance of line between the Harlequin drawing below and the design lines of the dress from pattern 2406. Perhaps those sketches were of some inspiration for Saint Laurent? Drawing by Picasso of a standing Harlequin, pencil on paper, 1916, & YSL’s ‘Picasso’ gown, as exhibited at The Metropolitan Museum of Art, New York. 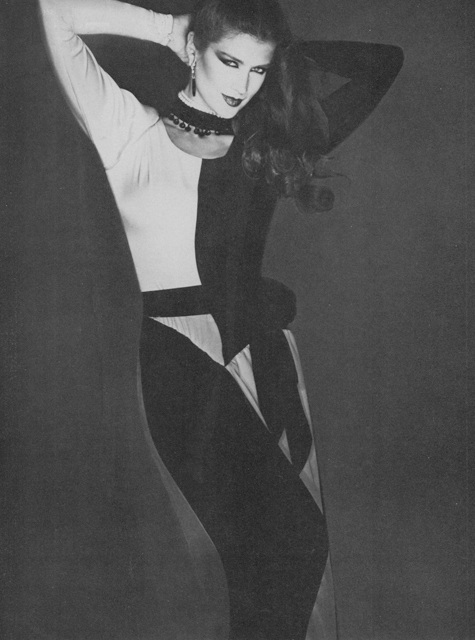 The black and white ‘Picasso’ gown was photographed for Vogue Paris’ September 1979 issue and, as pictured below, for L’Officiel’s fall couture collections issue, No. 655, 1979. Front Cover of L’Officiel No. 655, 1979, ‘Special Collections’ for Fall. Model wears Yves Saint Laurent. 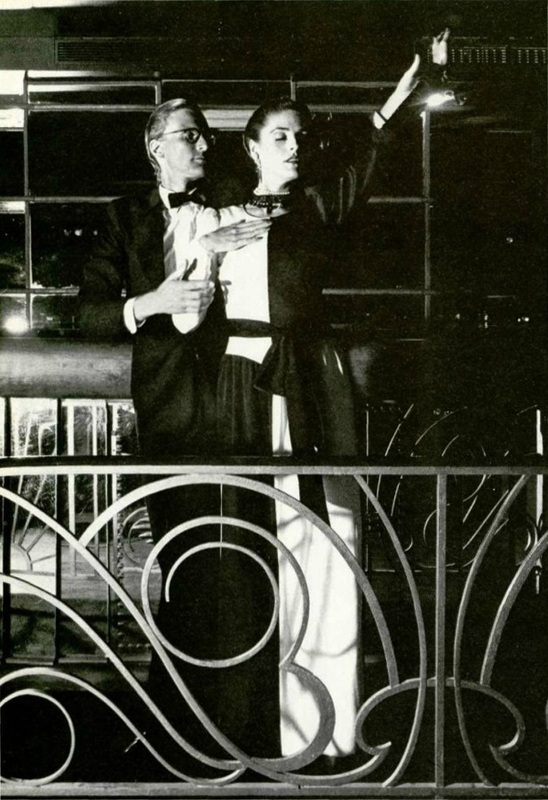 As seen in L’Officiel de la Couture et de la Mode No 655, 1979. The editorial shot below shows model Clotilde (once again) wearing the black and white ‘Picasso’ gown (I am unsure of the publication that the image originated from). Thanks to Supermodelicons.com for this image. 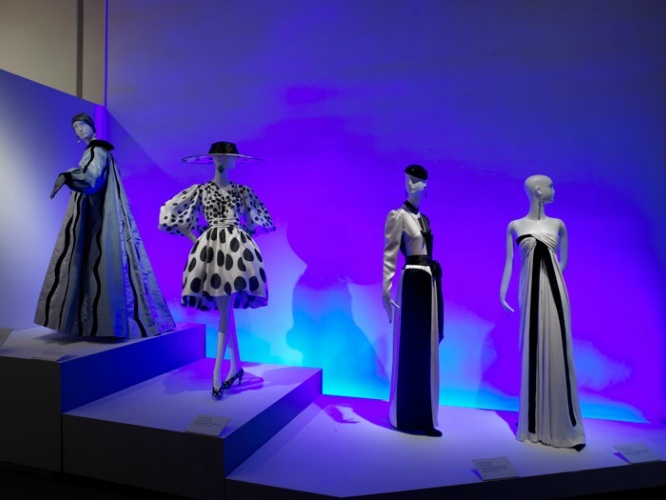 The black and white gown has also been included as an exhibit in many of the retrospective exhibitions for the fashion career of Yves Saint Laurent, the first being the 1983 exhibition ‘Yves Saint Laurent’ at the Metropolitan Museum of Art, New York, conceived and organized by Diana Vreeland – the very first of its kind at the Met dedicated to the work of one living designer. Others were the exhibitions ‘Yves Saint Laurent Style’ at the Montreal Museum of Fine Arts in 2008 and the de Young Fine Arts Museum of San Francisco in 2008/2009, and the exhibition ‘Nan Kempner, American Chic’, at the Met in New York in 2006/2007. Installation from the exhibition ‘Yves Saint Laurent Style’ at the de Young Fine Arts Museum of San Francisco, November 1 2008 – March 1 2009. Photograph of an Yves Saint Laurent original illustration with silk satin-crepe fabric swatches, from the exhibition catalog ‘Yves Saint Laurent Style’, 2008. As seen in the exhibition ‘Nan Kempner, American Chic’ at The Metropolitan Museum of Art, New York, December 12, 2006–March 4, 2007. 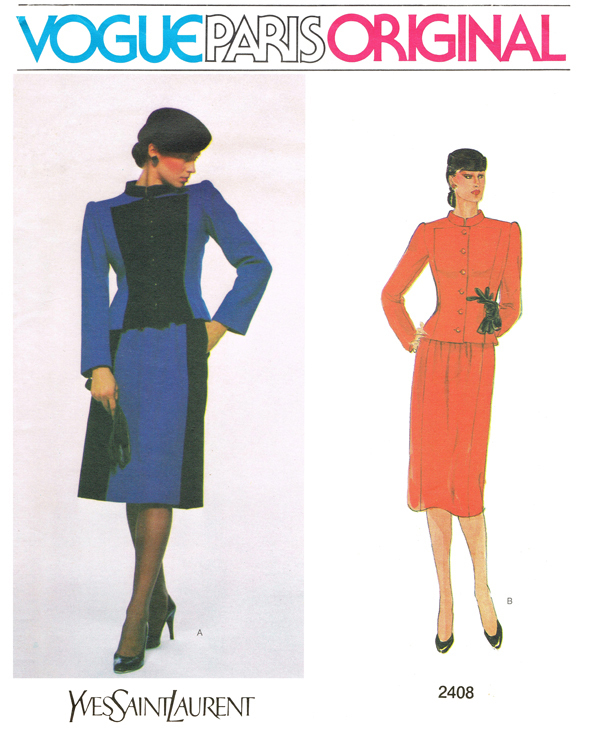 On to Vogue pattern 2408: a suit of skirt and jacket that features contrasting blocks of black and royal blue. 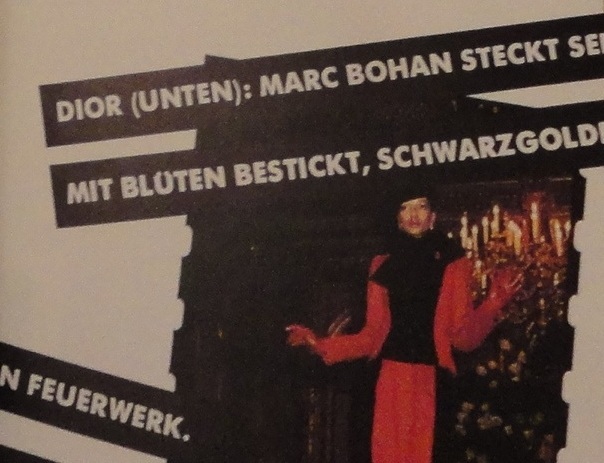 An almost identical suit to that of 2408 was also shown in the same collection, only it consisted of blocks of red and black, as seen below in a runway photo published in the October 1979 issue of German Vogue (modeled by Saint Laurent muse, Mounia). It is interesting that Bernadette mentions the two-fabric and two-color combinations, as this is what Vogue Patterns selected from the collection – and for logical reasons. Usually the only means for most home sewers to recreate a designer outfit from a sewing pattern was through fabric and with trim, such as piping and purchased braid. Therefore, any designer looks that would involve highly skilled applications such as intricate embroidery/beading or applique wouldn’t have been commercially viable for a pattern company’s concern. Also, Bernadette Morris mentions a white and black suit with “slimming” side panels to the skirt – these panels were repeated on the skirts of the blue/black suit of pattern 2408 and the red/black suit, pictured above. The white and black suit with velvet collar and lapels made the cover of Vogue Paris and was photographed for U.S. Vogue and for L’Officiel magazine. 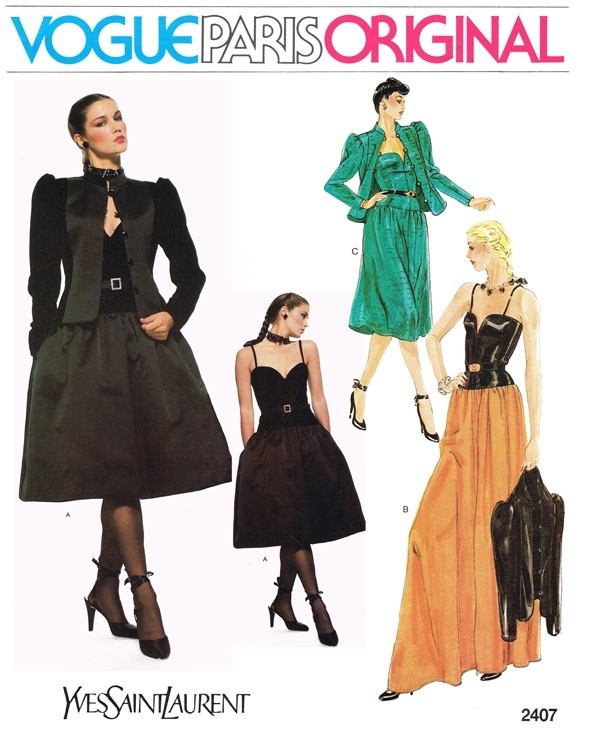 As seen in U.S. Vogue, September 1979 (Left) and L’Officiel No. 655, 1979 (Right). Finally, there is pattern 2407: a romantic ensemble of full-skirted cocktail dress and jacket with the silhouette that was most dominant for evening in the collection – a full skirt of either below-knee or evening length, gathered in at the hip. The upper body for most evening looks was fitted and, if with sleeves, topped with a ‘puffed’ sleeve head. The contrasting blocks of this ensemble are more tonal by way of the luxurious textures of black velvet and black satin. The full skirt is reminiscent of the ballet tutu, and the corselet-style top and satin sandals with criss-crossed satin ribbons evoke the romance of the ballet. Below you will see some examples of other dresses from the collection that share similar elements to that of 2407, whether it be the shape of the full skirt or the shape of the bodice. As seen in L’Officiel de la Couture et de la Mode No 655, 1979, this dress has a similar bodice and skirt shape to that of Vogue pattern 2407, however this dress has a skirt of glittering tulle that is suggestive of a tutu. Yves Saint Laurent evening dress of black silk velvet and yellow silk satin, AW 1979-80. 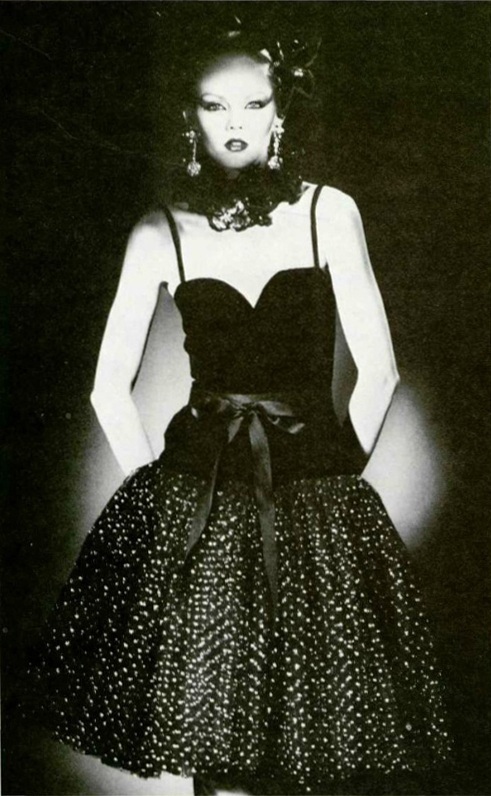 This dress was owned by Betsy Bloomindale and was donated to the FIDM in Los Angeles (Image will link to the FIDM’s blog article about the dress). 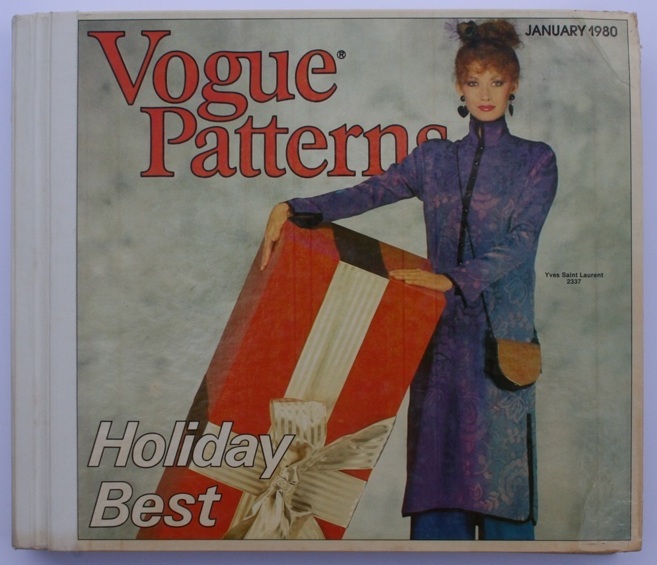 Interestingly, the three patterns 2406, 2407 and 2408 were not promoted in any issue of Vogue Patterns magazine (as most new designer patterns would have been) or, as far as I know, in any Vogue Patterns News flyer. 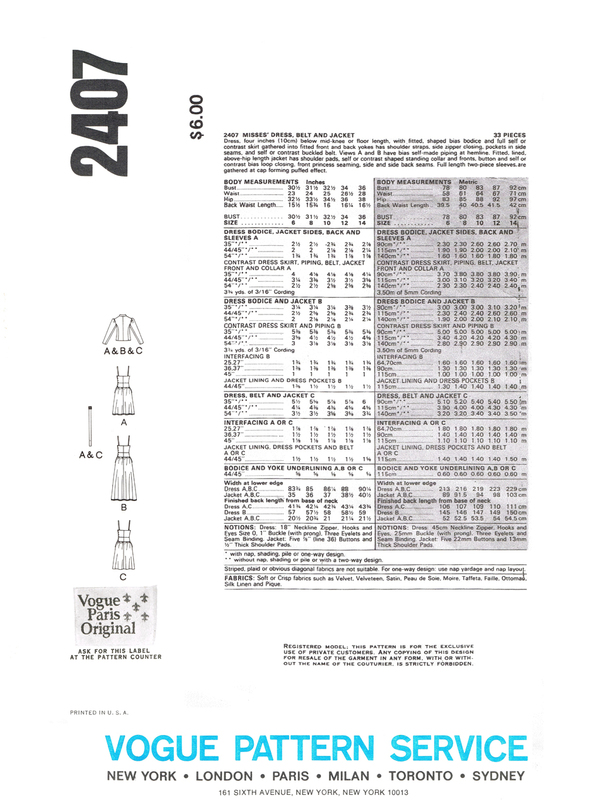 Also, unusually, the pattern details and yardage requirements were not available in the counter catalog for these patterns and in their place the consumer was advised to ‘Please see pattern envelope for additional information’. Another point of interest is the ‘Vogue Customized Collection’, where an asterix next to the pattern number inside the catalog indicated that the pattern had to be specially ordered from those stores that had this label affixed to the front cover of their Vogue Patterns catalogs. This would most likely have been a policy for smaller or independent pattern retailers who wouldn’t have carried the full range of patterns. 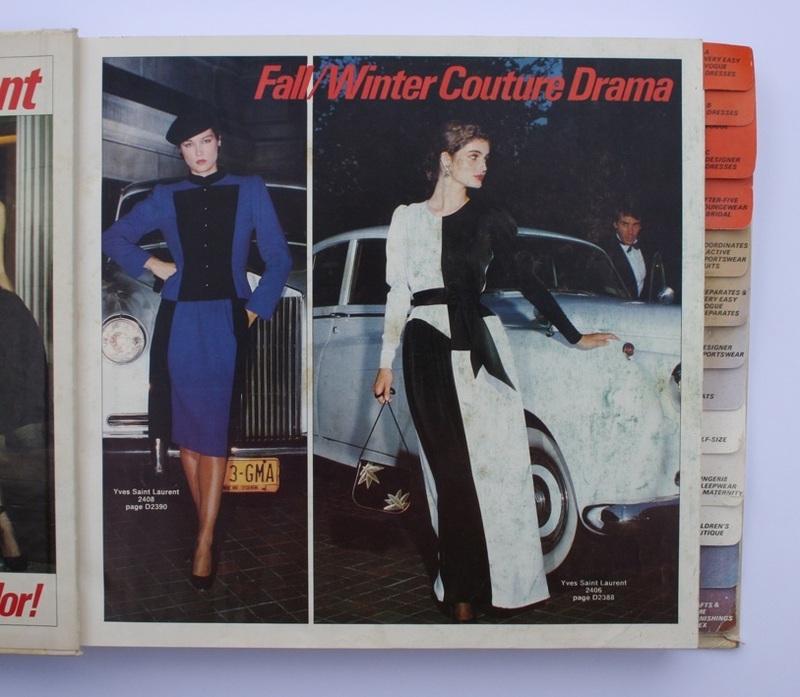 Directly below is an image taken from ebay of a copy of the January 1980 catalog with the ‘Customized Vogue Collection’ label affixed to the front cover. This copy of the Vogue Patterns January 1980 catalog had a label affixed to the front cover stating “Customized Vogue Collection – WE CARRY VOGUE’S NEWEST AND MOST POPULAR PATTERN COLLECTION in all sizes – Other patterns with * may be special ordered”. This included Vogue 2406 and 2407. 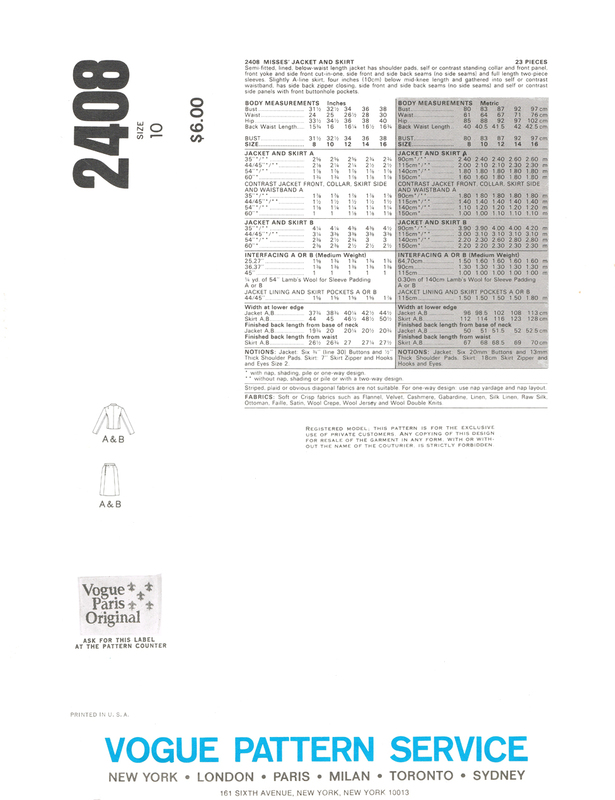 Patterns 2406 & 2407: “PLEASE SEE PATTERN ENVELOPE FOR ADDITIONAL INFORMATION”. Again, for pattern 2408: “PLEASE SEE PATTERN ENVELOPE FOR ADDITIONAL INFORMATION”. It is also interesting that the patterns were made available within the same season as the collection from which the designs were taken – usually patterns would be released the following season. I must say that these patterns are some of my favorites – it is for the beauty of the designs and for the glamour associated with Haute Couture, and it is because the designs originated from such a special collection from one of the world’s most brilliant designers. What a treat that these patterns were ever produced! 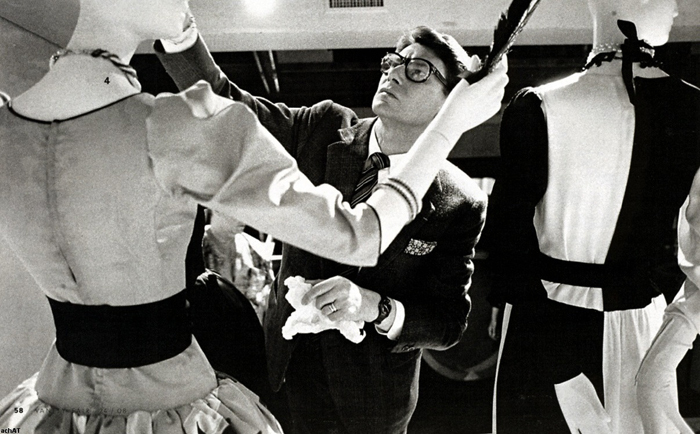 To end the post, below is a photograph of Yves Saint Laurent himself inspecting a display of two of his ‘Picasso’ dresses, most likely photographed sometime in the early to mid 1980s. 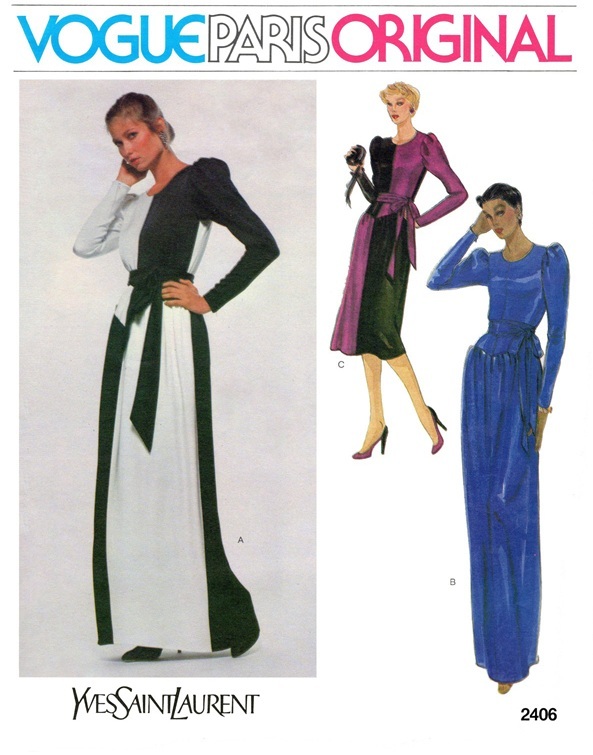 The black and white ‘Picasso’ dress of Vogue pattern 2406 can be seen on the right. Wow! What a well researched and fascinating post Dustin. You have given such a lot of insight into the design of this collection. These patterns are easy to come by too, giving us the option of creating such an amazing look at home. I especially appreciate the link to Picasso’s work and the fabric swatches. Thank you! Thanks Kate. I’m glad you enjoyed the post! I have had this topic in mind for a long time. 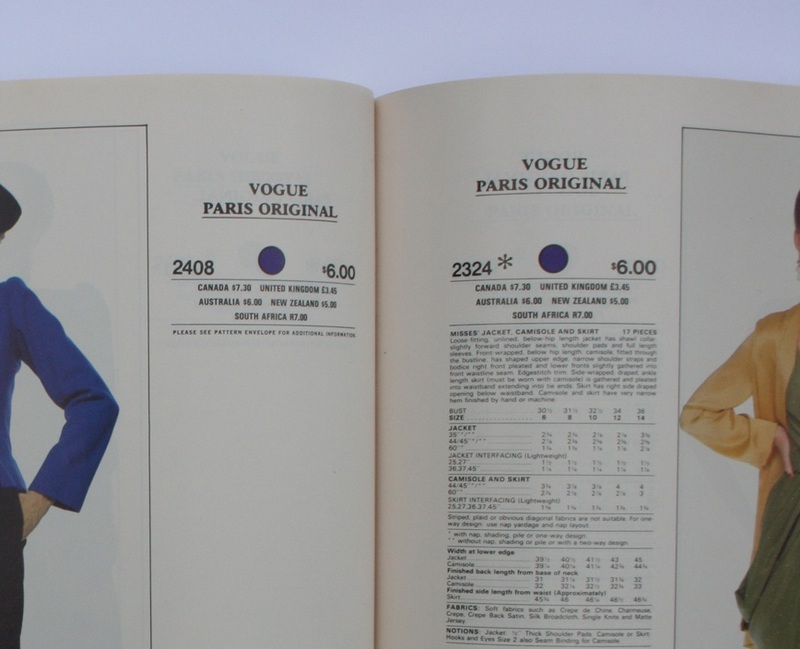 When I first saw the counter catalog listed on ebay a few years ago I went mad when I recognized the design of the dress of pattern 2406 from one of my books about Yves Saint Laurent. The idea for this post all began with that catalog and I’ve been collecting bits and pieces of information for it ever since. Well your commitment has really paid off. Excellent research, Dustin. I learned so much from this post. 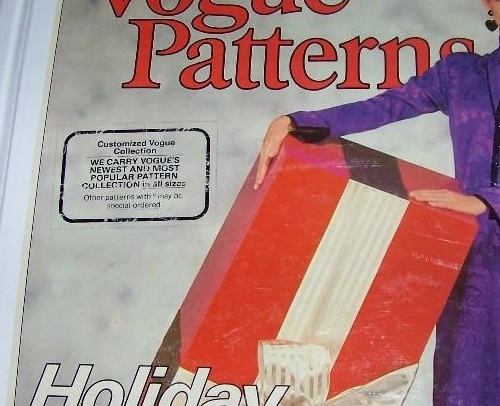 To think that I could have actually purchased these patterns in 1980 and did not do so… Sometimes it takes some distance, and a retrospective such as you have provided, to appreciate the genius behind such vintage style. I now often think back to myself being in high school in the late ’90s and not realizing at the time how special Alexander McQueen’s Givenchy patterns were and how collectible they were to become – and now I regret not buying them all up when I could! The same thing goes for Yves Saint Laurent patterns and other designers who licensed to Vogue Patterns at the time – who was to know that the licenses were soon to come to an end? Certainly not me. Even today I wonder about certain patterns – whether I might some day regret not buying them while I could at a reasonable price. But I can’t possibly buy them all – I have to choose the ones that I like most. However, I did take to buying all of the Chado Ralph Rucci patterns that came out, as the pattern cutting is interesting and I like the unusual couture techniques involved in the construction. By the way, did you hear? 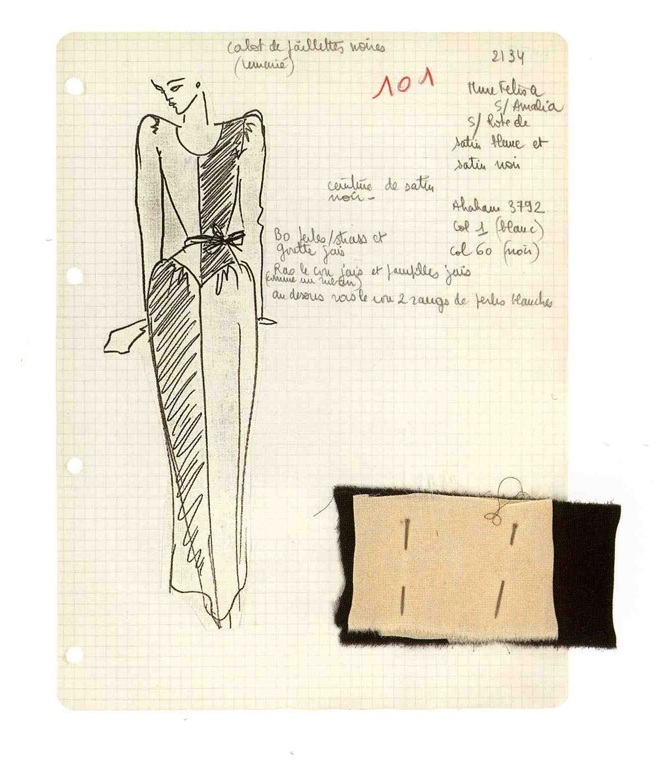 Ralph Rucci recently left his position designing for his namesake label. Perhaps these patterns will seem even more special in a few years, in retrospect, too. A lot of detail here– thanks, Dustin! I was especially interested to learn about the catalogue asterisk system; it helps explain the (frustrating) rarity of those patterns. It’s strange that they wouldn’t be in the magazine, isn’t it? I’ll double-check my mother’s collection over the holidays. Hello, the “custom collections” that Vogue Patterns offered were not aimed toward consumers. 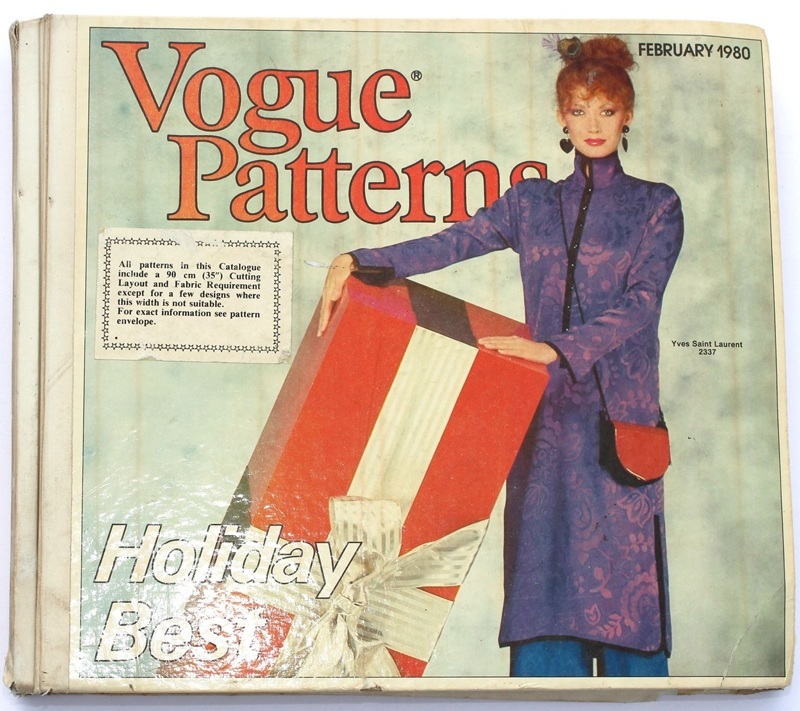 Each store that carried Vogue Patterns was on a “program” (a custom collection). Most stores could only afford to carry the core collection. Other stores carried all the patterns, but in the most common sizes (let’s say sizes 10 and 12 or so. Pattern weren’t multi-sized then). If a store carried the complete line of patterns AND sizes, that was an exception. The sticker was added to the catalog of the stores who were on the less complete “programs” so that people would know to ask at the counter for the pattern and size of their choice. Then the store would take payment, and submit the order with their daily re-orders. It was a great way to keep customers coming back into the store. Yes, I assumed that the ‘custom collection’ was not aimed at consumers and that it was because there were stores that could only carry a limited offering of patterns – I thought I had indicated that in my post. However, I didn’t know anything about limited sizes. My incorrect assumption was that if a store carried a particular pattern, then they would have had the complete size range in stock, so thanks for informing me on that point. Designer Imitation: Vogue 7079 – YSL Pop Art Dress. Paris Enthusiasms: Introducing Pierre Cardin. An Eye-Opening Trip to India.